Sink into this lush, high-ceilinged dining room from decades past. 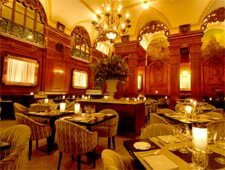 : Could there be a more storied dining room in New York than The Oak Room? Maybe not. Built in 1907, the ornate room today is gleaming with---you guessed it---plenty of oak as well as high-ceilinged glamour. You can almost smell the movers and shakers making deals here. The menu is an impressive seasonal American tour de force which comes in a prix-fixe form. The foie gras PB&J (toasted brioche, foie gras, macadamia nut butter, and grape jelly) is an obligatory indulgence. The crispy Berkshire pork belly and pan-seared scallops stacked with chorizo and Catalan-style quail egg yolk both offer memorable layers of flavor. They almost eclipse the entrées. But save room for the lobster and sweetbreads potpie (which is really more of a stew) and the ultra tender roasted short rib pot au feu (accented with bone marrow custard). The wine list is extensive and globe-spinning with some nice options by the glass.